In 1910, a young Bengali student from Calcutta arrived at the University of Wisconsin to complete his BA degree. His name was Basanta Koomar Roy. In those days, coming to America for higher education was a growing trend. Rabindranath Tagore pioneered the trend by sending his son Rathindranath to USA for studying agriculture for he felt that “It is better to be a farmer from Illinois than to be a gentleman from Oxford!” Basanta Koomar being an ardent fan of Rabindranath, was most likely inspired to come to America for the same reasons. He later mentioned (in his publicity brochure), “… by receiving an American education he would be able to serve his Motherland more efficiently.” And although he did not go back to India, he did serve his Motherland handsomely. Basanta Koomar took up journalism with a mission to bring India closer to America. During the early part of the twentieth century, information about India came to America filtered by the British media. The nationalist uprisings in India, the literary and cultural renaissance taking place in Bengal was hardly noticed in America. Basanta Koomar took upon the duty to inform the Americans about India. He wrote in almost all major American publications about British misrule and atrocities in India, about the art and culture of India, as well other social, political and cultural issues. However, the pinnacle of his career came when he published the first ever English biography of Tagore, “Rabindranath Tagore – The man and his poetry” in 1915, less than two years after Rabindranath was awarded the Nobel prize. But Basanta was writing about Rabindranath for quite some time then, and the book was essentially a compilation of his earlier articles. His first article on Tagore was published in the July issue of “The Open Court” in 1913, well before the Nobel prize announcement. According to Sujit Kumar Mukherjee, the noted Tagore researcher, Basanta Koomar Roy was one of the three people primarily responsible in making Rabindranath well known to the West. The other two being W. B. Yeats and Ezra Pound. Basanta Koomar’s biography of Tagore was a huge success and it was more popular than several other biographies that were published during the post Nobel prize era. The critics liked it mostly because it was written by a fellow Bengali who read Tagore in his mother tongue and not his translations. His articles and translations on Tagore were in high demand. He toured around the country lecturing about Rabindranath and his works. But apparently, Rabindranath was not at all happy with Basanta Koomar Roy. It seems some of his admirers in America had informed him that Basanta Koomar was freely translating and publishing Tagore’s works without his permission and making money. He was also informed that Basanta Koomar was spreading all kinds of misinformation and lies about him. However, till date nobody has been able to find any such article by Basanta Koomar that spoke ill of Rabindranath. Unfortunately, Rabindranath did not make any attempts to verify the allegations. Rather he was so upset that he wanted to return his biography by Basanta Koomar without ever reading it. But after 1916, Basanta Koomar seems to have stopped writing about Tagore for reasons that we can only speculate about. He became more active with the Indian nationalist movement and was working closely with Taraknath Das, Lala Lajpat Rai and others. During that time, the American immigration authorities (under the influence of British agents) were actively pursuing deportation of Indian immigrant laborers. Basanta Koomar along with his colleagues (Taraknath Das, Agnes Smedley and others) fought against the Immigration authorities in US courts and freed these Indian immigrants held in detention. He was an active member of the Friends of Freedom for India, and the editor of the India News service. He kept on writing about the social, political and economic issues in India. But those articles hardly mentioned about Tagore. He also later translated and published Bankim Chandra Chattopadhyay’s novel Anandamath. He was also an actor and had acted at the Neighborhood Playhouse in “Salut Au Mond”, a play based on Walt Whitman’s poetry. Today, Basanta Koomar Roy is a forgotten name. He is only known to a handful of people of this generation. But as an Indian American, I feel that we have been unjust to this man. Basanta Koomar may not have always followed the journalistic norms (although that’s a topic for a separate debate), but his contributions were significant. The recognition we have as Indians to the American people, we owe quite a bit of it to people like Basanta Koomar Roy, who was possibly the first Indian American Journalist. Basanta Koomar Roy died in New York in 1949. My play “The Last Flames” is an homage to this predecessor of ours, as much as it is to the great poet Rabindranath Tagore. This entry was posted in Arts-Culture and tagged basanta koomar roy, play, rabindranath tagore, theatre, works of rabindranath tagore by sudipta. Bookmark the permalink. I know Sudipto, who has written the play. And I fondly remember a long telephonic conversation with him last July. Kudos to Sudipto and his team for having staged the play on Basanta Koomar Roy. One observation: The author’s name should be clearly mentioned somewhere as a credit line, so that when the page is shared, the author is not missed out. Thank you Ranjon-da. It seems the new version of by blog platform skips the author name. I have added it. Thanks for pointing it out. Very well-written summary of one of the pioneering expatriate journalists who worked much to bring India closer to the Americans. Last Flames does capture this forgotten chapter of history well. 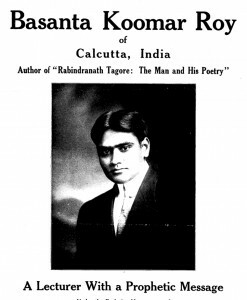 I wonder how Basanta Roy’s times were – were his writings accepted with open arms? Did he have to fight hard to overcome race discrimination? How did he manage to influence people and reach such a large audience? Charisma, help from friends? As a parting thought, I wonder how many such lost souls are out there, who did so much for India but did not gain their recognition.